S&S Cycle was born and raised from racing American V-twins. The company has even been a bigger supporter of American motorcycle racing than some OEMs. When you have that kind of street cred behind you, no one’s shocked when you step up your game to promote the sport. So far, 2018 is shaping up to be an epic year in the world of flat track racing with a highly competitive field and the largest contingency program in the history of the sport. One of the standouts is S&S Cycle whose high performance exhausts were often seen on the podium last year. This season they’ve expanded their efforts to include Kawasaki- and Harley-powered twins as well as privateer Indian racers (excluding the Indian Motorcycle Wrecking Crew). There’ll be payouts down to 10th place with over $70,000 up for grabs and another $5000 for a championship. 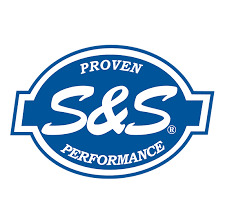 For the first time, S&S is also offering a custom exhaust build and dyno tuning session at no additional cost in their Wisconsin facility (by appointment only). All S&S systems are constructed from lightweight stainless steel and all are designed to meet the 105dB sound limit. What started as a passion for speed, grew into the best known company name in the V-Twin high performance aftermarket. George J. Smith had to build his own parts to make his motorcycle faster. Now the company he founded manufactures the most pretigious line of "go fast" v-twin engine parts in the world. The company was started in the basement of his home in Blue Island IL in 1958, and moved to Viola, WI in 1969. In 2004 an additional facility was opened in La Crosse, WI.